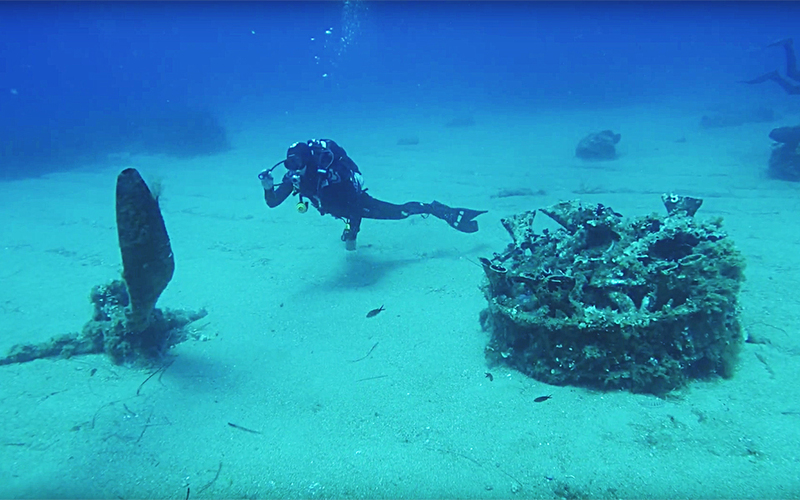 A team of divers discovered twin-engine bomber lost for 72 years laying in the depths off Ikaria. 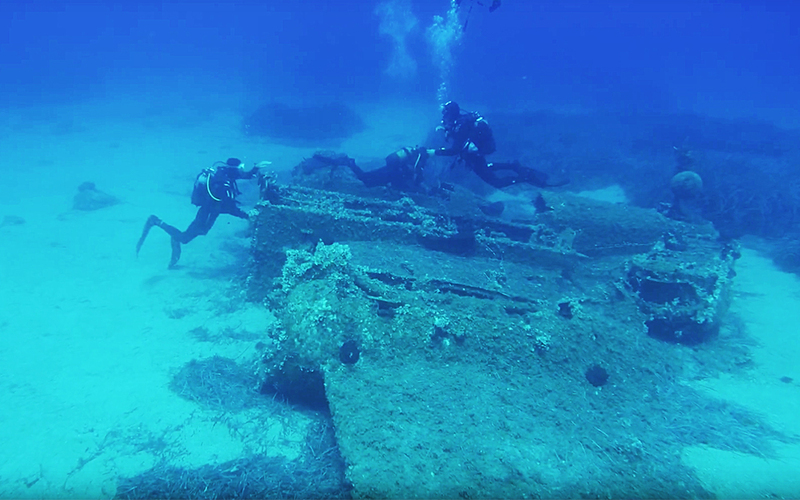 The twin-engine bomber lay undisturbed in the depths off Ikaria in the eastern Aegean for 72 years until a team of divers discovered the old fighter plane on the seabed, 18 meters beneath the waves.Though the dive may have lasted no more than 45 minutes, the information that guided the divers to that specific underwater spot had taken years of research. The team had pored over Air Force data and photographs taken during an earlier diving expedition in the region, while the diving team’s leader, Dimitris Lesses, took notes from testimonies provided by elderly eyewitnesses hailing from a village close to where the Martin Baltimore went down. “On July 11, the day of the dive, the old men of Magganitis [village] were present to tell us the story as they experienced it back when they were children,” diver and and mission coordinator Alexandros Malagaris explained to Kathimerini. “We wanted to photograph and film the Martin Baltimore; bring its history to light and pay tribute to its crew,” he added. Others have since visited the wreck. This screenshot was taken from the youtube video "Ikaria Trip". The historical discovery was captured in impressive photographs taken by Stelios Demertzis, the diving team’s third member. One of the plane’s four crew members, navigator Vassilios Demertzis, who survived the crash along with one other man on board, pilot A. Dimopoulos, is an uncle of the mission’s photographer. The two other crew members who lost their lives were radio operator Sotirios Vathis and airman Ioannis Zacharopoulos. It became evident to the divers during their limited time underwater that the fighter plane had become a part of the underwater environment over the years. After marveling at the spectacle for a while, they left a laurel wreath in honor of the plane’s crew. “The Martin Baltimore has been protected from 1945 to the present due to the depth at which it is located. We now hope that residents of and visitors to Ikaria offer it even better protection,” Malagaris said. According to Hellenic Air Force Museum archives, the Martin Baltimore crashed into the sea off Ikaria on April 20, 1945, while its four-member crew was practicing a flight maneuver. As noted in the historical archives, the aircraft, part of the 13th Light Bombardment Squadron, ran into adverse weather and fell into the sea an hour after takeoff due to engine troubles whose cause remains unknown. Its pilot attempted a forced sea landing close to the village of Magganitis, but the collision with the water proved overwhelming. The Hellenic Air Force used a total of 79 Baltimore fighter planes, built by the Glenn L. Martin Company in the US. The first batch arrived in Greece in September 1943, delivered by the British Royal Air Force. Roughly a year later, in the fall of 1944, the Martin Baltimores passed on to Greece began launching attacks on German targets on Aegean islands. Of the 1,575 Martin Baltimore fighter planes built in total, not a single one exists in perfect condition. This sense of rarity adds to the accomplishment of the Greek sea divers off Ikaria.